Over the past two decades there has been increasing concern about the exposure of humans and wildlife to chemicals that have the potential to interact with the endocrine system and reproductive functions, we know them as Endocrine Disrupting Chemicals or EDCs. Endocrine disrupting properties have been investigated for a wide range of classes of compounds including natural products, pharmaceuticals, pesticides, phthalates and industrial chemicals. Emerging contaminants such as Per- and Poly-fluoroalkyl Substances (PFASs) and hydraulic fracking chemicals, are also presenting new challenges. Cell-based or in vitro investigative approaches have become more widely used as they provide a rapid means of screening samples for potential adverse effects through specific receptor-mediated or cellular endpoints, but is this enough? From an Australian perspective, CSIRO proposes that applying a multi-tiered decision framework, incorporating both whole animal testing (in vivo) and cell-based (in vitro) investigative procedures, allows for better understanding the risks of these chemicals. Countries such as Europe and USA are already applying this approach, while Australia’s current guidelines, although being revised, are not picking up these emerging contaminants. “To understand cause and effect across different levels of biological organisation within an ecotoxicological context, a tiered approach at different levels of organisation within an Adverse Outcome Pathway framework, will help us maintain a connection to the individual and population level risks we wish to manage.” says Dr Anu Kumar from CSIRO. While hormone receptors are evolutionarily conserved among vertebrates, the responses can differ markedly between mammalian receptors and the corresponding receptors in fish. With this consideration in mind, if risk to the health of aquatic organisms is to be accurately estimated, it would be more appropriate to employ in vitro bioassays based on receptors from susceptible organisms, rather than assays based on the human receptor. Fish are considered as one organism most at risk from EDCs, especially those that specifically interact with normal functioning of reproductive hormones. 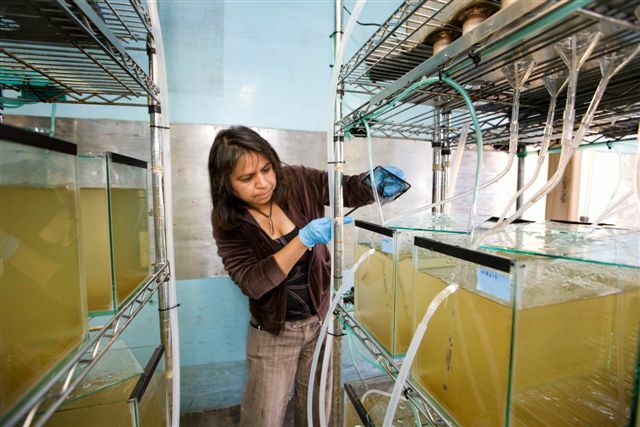 Fish have been observed to undergo feminisation in numerous freshwater and estuarine ecosystems due to the presence of EDCs such as steroid estrogens. Regulatory bodies around the world are beginning to take considerable action regarding restrictions or bans on selected EDCs, with many more placed on watch lists for future assessment. Europe and USA are taking a far more rigorous approach to EDCs, recognising the financial benefits of preventing disease through reducing exposures to these chemicals. The Australian environment poses some unique challenges and contrasts. It is a land of climate extremes with high summer water temperatures and seasonal river flows, and for many large river systems, treated effluent is a major component of flow. Climate change predictions suggest dryer conditions for much of non-tropical Australia, which will also add pressure to adopt water reuse schemes more widely. “We need to be proactive in addressing these issues,” says Dr Kumar. To provide data to practitioners for understanding the risks associated with EDCs in the Australian environment, funding is needed to carry out a nationwide, multi-tier, integrated research strategy program to develop environmentally relevant knowledge. In November 2007, Australian and international researchers, policy makers, regulators, water suppliers and research investors drafted the first national position paper on EDCs, The 2007 Black Mountain Declaration on Endocrine Disrupting Chemicals in Australian Waters. The paper focuses on environmental and human health implications and recommends future research objectives as well as attention to policy and public awareness. Dr Anu Kumar is currently leading an Australia India Strategic Fund (AISRF) project, Identification and management of sewage effluent discharges to keep our rivers healthy: Comparative investigations in India and South Australia. 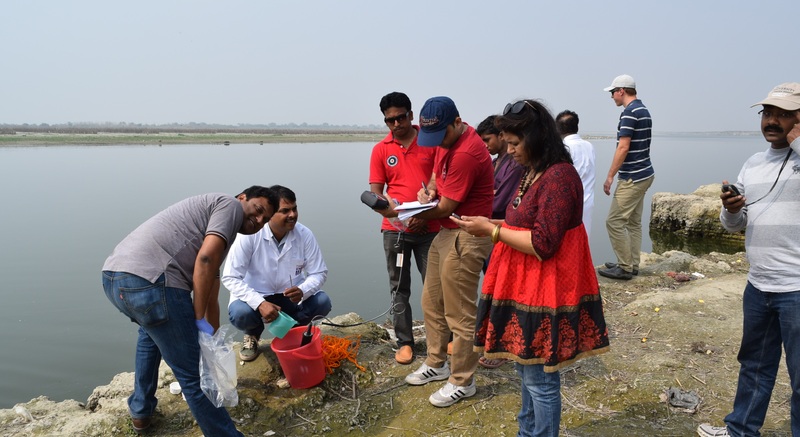 The main aim of the study is to employ a risk-based approach combining both biological and chemical assessment to identify and determine the impact of selected emerging contaminants including EDCs discharged via sewage effluent into Indian and Australian rivers. To facilitate risk communication, the information gained can contribute to updating water quality guidelines and assist in the risk management of new emerging contaminants in our environment. To learn more about this topic and this project, join Dr Kumar in a live, interactive webinar. Dr Anupama Kumar is Group Leader, Contaminant Biogeochemistry and Environmental Toxicology at Commonwealth Scientific and Industrial Research Organisation (CSIRO). Ankley GT, Bennett RS, Erickson RJ, Hoff DJ, Hornung MW, Johnson RD, Mount DR, Nichols JW, Russom CL, Schmieder PK, Serrrano JA. (2010) Adverse outcome pathways: A conceptual framework to support ecotoxicology research and risk assessment. Environ. Toxicol. Chem. 29: 730–741. Bain, P.A., Williams, M., Kumar, A. (2014) Assessment of multiple hormonal activities in wastewater at different stages of treatment. Environ. Toxicol. Chem., 33: 2297-2307. Kumar, A., Williams, M., Woods, M., Kookana, R., Barber, L., Vajda, A., Doan, H., Gregg, A., Gonzago, D. & Bain, P. (2012) Treated effluent in the aquatic environment: impact assessment of endocrine disrupting chemicals. Report to the National Water Commission EP12292. CSIRO: Water for a Healthy Country Flagship. Marty, M. S., Blankinship, A., Chambers, J., Constantine, L., Kloas, W., Kumar, A., Lagadic, L., Meador, J., Pickford, D., Schwarz, T. and Verslycke, T. (2017), Population-relevant endpoints in the evaluation of endocrine-active substances (EAS) for ecotoxicological hazard and risk assessment. Integr. Environ. Assess. Manag.13: 317–330.